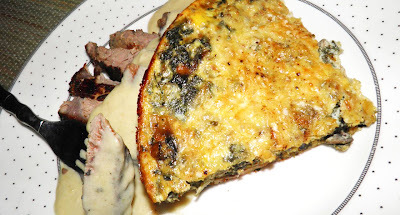 A mushroomy frittata with slices of steak and creamy garlic sauce. Hungry yet? This recipe is a way to use a winter green that we should all be eating more of. I just ended a sentence in a preposition…. I hate doing that. Grammar police, come get me. What I don’t hate any more is kale. Previously, kale was something I felt I should eat because it was good for me, and available in the grocery stores in the dead of winter. Did you know – if you plan ahead – you can be growing your own kale outside in Nova Scotia even now in January. I know people who do it. And that's not all they grow 4 seasons. Kale has a very “earthy” taste. I really don’t know how to describe it. Maybe saying it resembles Swiss chard is a good start. It can be an acquired taste if you don't like strong flavours. But we should be adding it to our diets. It’s a nutritional powerhouse. It’s low in calories, high in fibre and zero fat. Kale is high in iron and vitamins A, C and K. It has antioxidant and anti-inflammatory properties. Kale offers cardiovascular support by lowering cholesterol. Kale is high in calcium. Kale is also useful as a detox food because of its high fibre and sulphur content. Kale has been given several nutritional monikers, including being called “the new beef.” I don’t know if I would go that far. It’s not very brown or very meaty… But that doesn’t mean it’s not good. I like carrots and they're not very beefy either. I’ve actually grown quite fond of it, and will be trying to over-winter some this year if possible. 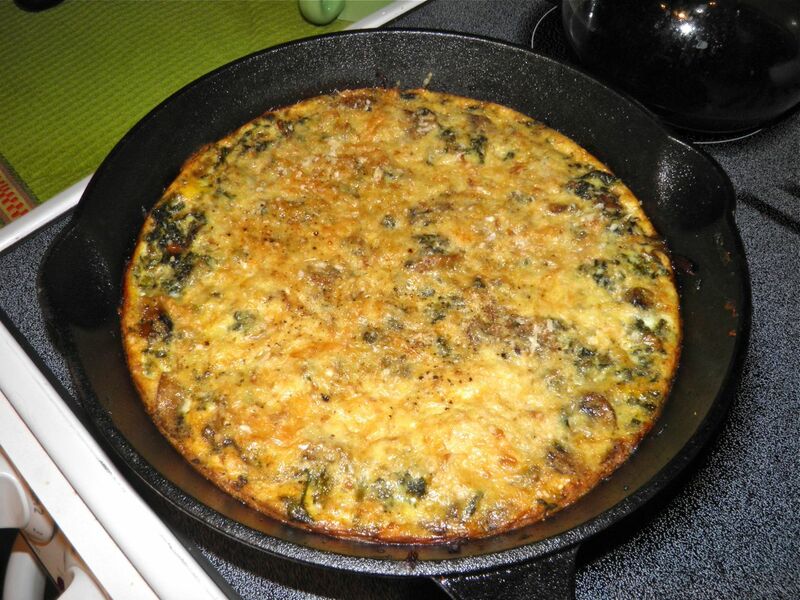 A really nice way to enjoy it is in a frittata. Essentially frittata is a “fancy” Italian omelet. Whereas an omelet is finished on top of the stove, frittatas are most often baked. Ingredients are distributed in the egg mixture before it is placed in the oven. They can have onions, mushrooms, greens, potatoes and/or bacon. My recipe has no bacon, but if you wanted this as a single dish for brunch add about a cup and you’re done. I served this with steak and a most amazing garlic sauce. Originally I made the sauce for the steak, but the frittata is so hearty it is just as good served with that on the side. If you’ve never eaten kale perhaps this is a place for you to start. 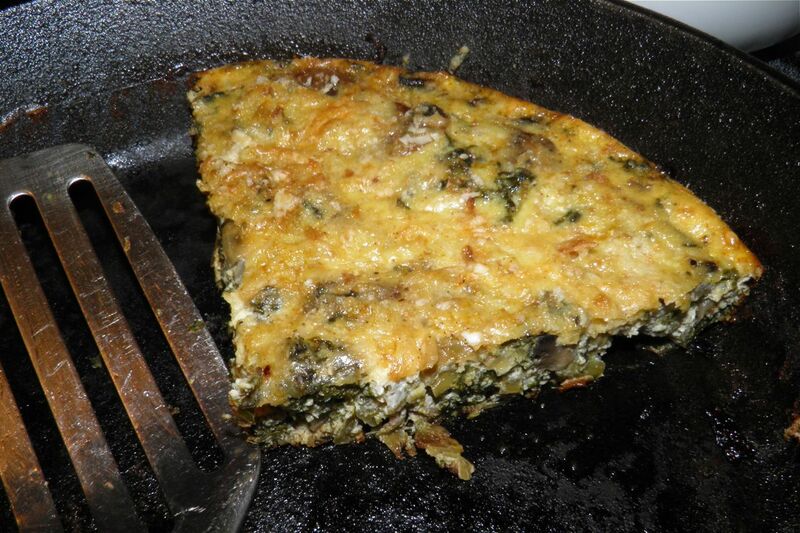 I wished I had made more…which translates into this dish will most definitely be made again. Heat the oil in an oven-proof frying pan. 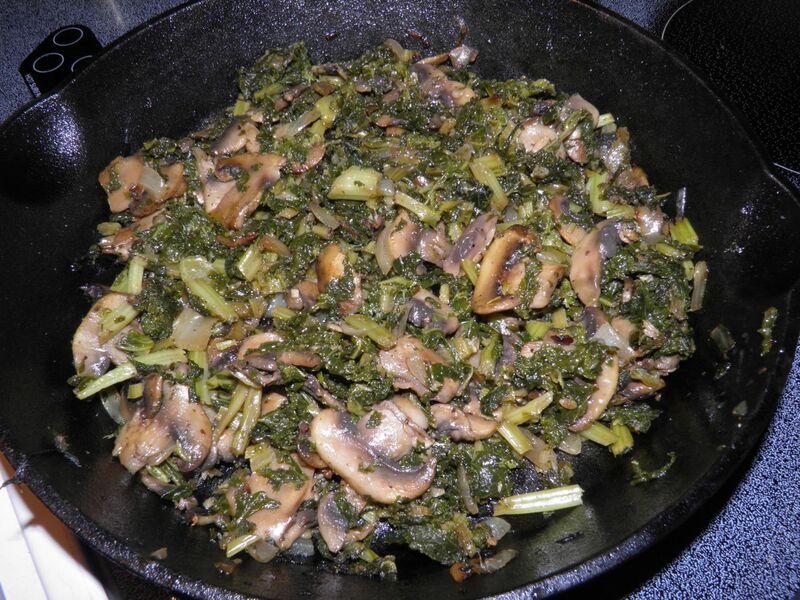 Add the mushrooms, onions and garlic and sauté until the mushrooms start to brown slightly. Stir in the pre-cooked kale. Whisk the eggs, milk, cayenne, salt and pepper together in a bowl. Pour over the mushrooms and kale in the pan and stir to distribute the mixtures together. Sprinkle the top evenly with the cheese and breadcrumbs. Let the mixture cook on top of the stove until you can see it just beginning to set around the edges, about 2 minutes. Place in the preheated oven and bake for 30-45 min. The time will depend on the size of your pan and the depth of the frittata. My 10” cast iron took 40 minutes. Serve as a main dish or side for brunch or dinner. Sauté the garlic and onion in the butter over medium heat until the garlic is soft and very fragrant, but take care not to burn. Mix the cornstarch with a tablespoon of the stock. Add the resulting slurry, remaining stock and cream to the garlic. Bring to a boil, reduce heat slightly and let cook until the amount of liquid has thickened, about 4-5 minutes. 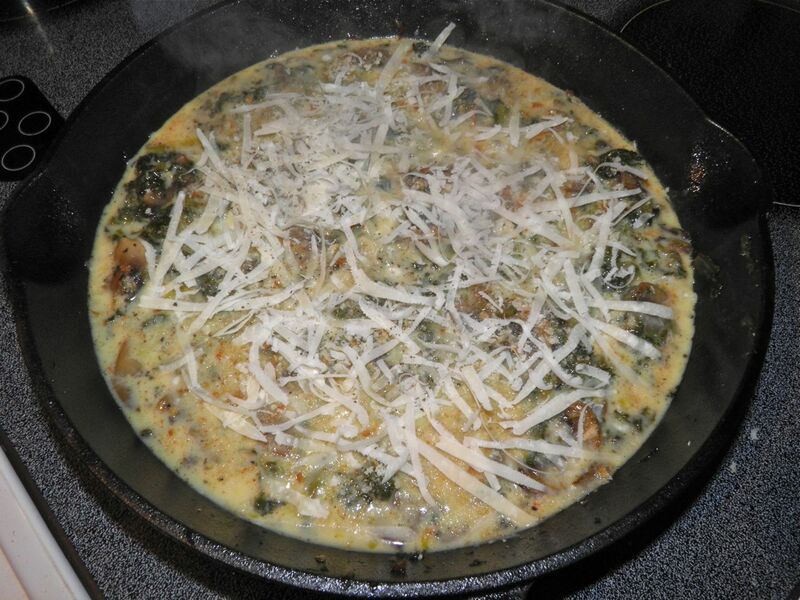 Serve with the frittata, or on top of grilled meat as part of a meal.